Even for holiday occasions, like Father's Day, I always try to include a few cards to send specifically for the kids through Send a Smile 4 Kids. I just sent off my latest package to them, and this was one of the cards I created to encourage a hospitalized child. I cut a panel of Canson XL Watercolor paper to 4.25x5.5". I determined how much I wanted for the beach, and cut that strip off from the panel. I inked the textured side of the beach piece with Antique Linen & a bit of Brushed Corduroy Distress inks. I spritzed the panel with water from my Distress Sprayer, and lifted off the water & ink. That bleached the ink in spots a little too much, though, so I went over the panel again with Brushed Corduroy, without reinking my blending foam, just to add a little color back in. For the sea & sky, I used the smoother side of the watercolor paper. I masked off the sky, and stamped the waves from "Stay Salty" (designed by Julie Ebersole for the Essentials by Ellen line) several times with Versamark ink. As I went, I sprinkled Wow White Pearl embossing powder on the waves, so I could see where I had stamped. When I had finished stamping, I used my heat tool to melt the powder. Then I inked the sea with Salty Ocean & Peacock Feathers Distress inks. I removed the masking, & inked the sky with Tumbled Glass, adding some shading with Broken China. I stamped the seagull from "Stay Salty" in Versafine Onyx Black ink onto some Canson XL Mixed Media paper. I colored him (her?) with my Tombow markers. I also stamped the anchor & life preserver, coloring directly on the stamps with my markers. For the anchor, after I'd colored it in spots with 3 different markers, I spritzed it lightly with water to mingle the colors and then stamped it. The colors still came out spotty, so I used a water brush to blend the colors a little more. I stamped the clouds with Salty Ocean, on mixed media paper. Finally, I cut all the images with the coordinating "Stay Salty" dies. I also punched a crab from red cardstock using an old Martha Stewart punch. I did a bit of shading with markers, & glued on tiny googly eyes. 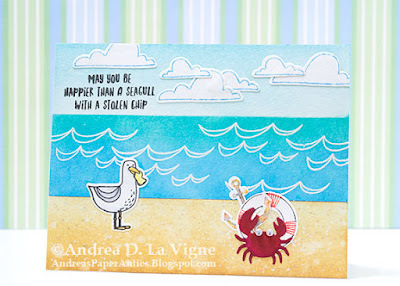 Because I wasn't sure if I wanted to add anything else, to assemble my card, I joined the beach & sky/sea panels by adhering them to a strip of cardstock. I glued my images on with Perfect Paper Adhesive. I stamped the greeting in Versafine on the sky. I decided I didn't need to add anything else, so I went ahead & adhered the card front to a white A2 card base. As a finishing touch, I added dots to the beach with both a white Sakura Gelly Roll pen & a Sakura Star Dust glitter pen.